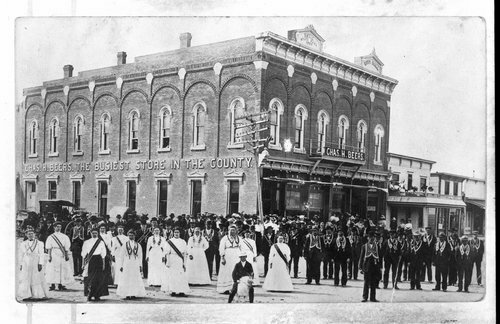 This photograph is of unidentified fraternal groups posing in Hoxie, Kansas. They are in front of the Chas. H. Beers general store "The Busiest Store in the County" building. There is an electric pole on this street corner. A car is in the background. Several people are seated on upstairs porch of building to the right.